The Micha OVL15A and OVL30A Over-Voltage Limiters are linear voltage regulators which limit the voltage at the output terminals to a preset maximum to prevent excessive voltages from being applied to the load equipment. 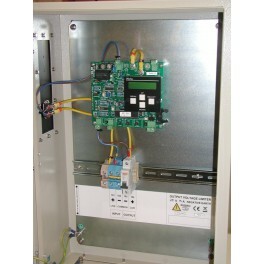 Although primarily designed for PV systems, the units are capable of operating with any stable DC power source. The units are available in two output current versions: 15A and 30A and in two input voltage versions: 12-24V and 24-48V. The units function by using one or two high power MOSFETs in series with the output, which create a variable resistance and thus control the output voltage seen by the load. When the source voltage does not exceed the required maximum output voltage, the OVL MOSFETs are switched full on, presenting a series resistance of around 5mOhms, making the OVL highly efficient. The limiting factor of the OVL is the maximum dissipation created by the series MOSFETs. The OVL15A has a single MOSFET with a limit of 90W. The OVL30A has two MOSFETS and a limit of 180W. Document 801450 discusses the power considerations for the OVL range. A 2-line by 16-character alphanumeric LCD display on the Control PCB Assembly shows input and output voltages, output current and allows the user to set various alarm and output trip levels, which can be signalled using the volt-free c/o relay. Various surge and over-current limits can be set to allow for different types of load, with automatic and manual reset trips available.